Jess was one of the Beat Generation artists active in the 1950s who pulled directly from the rich storehouse of themes and imagery of American popular culture. 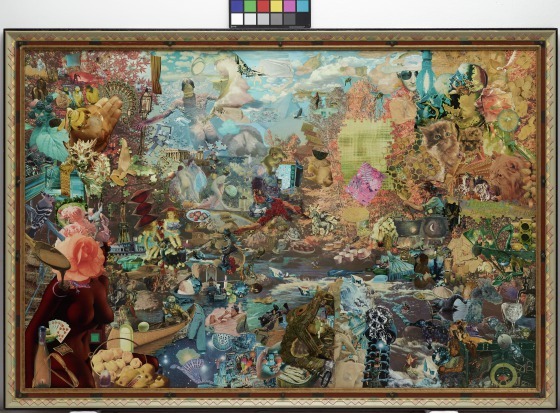 Arkadia's Last Resort is a prime example of his densely layered art of collage and juxtaposition, part of a series of works called "Paste-Ups," which originated in the early 1950s. Collage has attracted many practitioners, but few have exploited its possibilities so insistently as Jess. 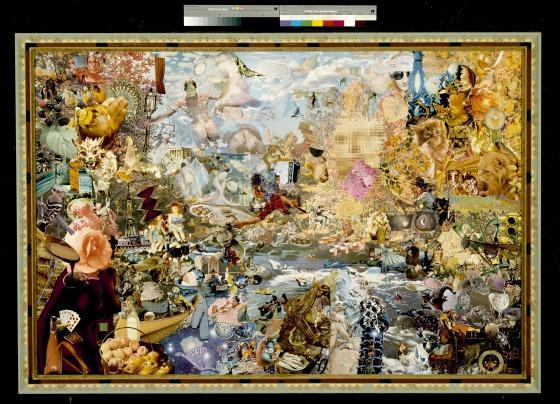 He built on the work of early 20th century painters experimenting with collage, who expressed a dissatisfaction with the continual obligation to make illusions of things, and therefore chose to physically adhere either photographic reproductions or the actual things themselves to their canvases. 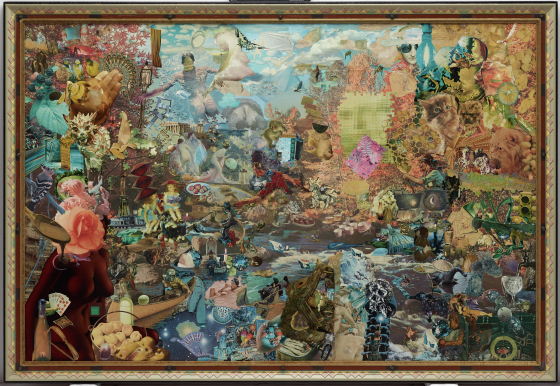 Jess magnifies both the scale and intensity of the procured images in his work, creating large panoramas of multiple media and subverted meanings. 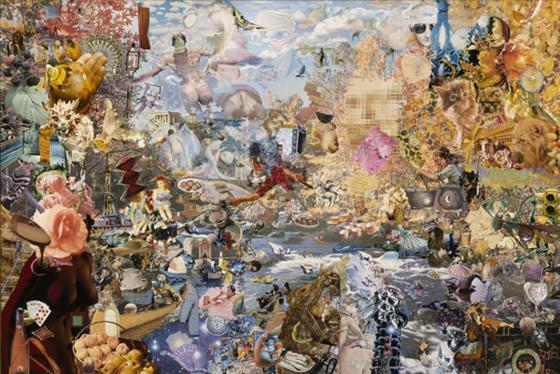 In Arkadia's Last Resort; or, Fête Champêtre Up Mnemosyne Creek, Jess collaged dozens of images lifted from jigsaw puzzles, art books, advertisements, and store catalogues, ordering them into the rudiments of an idyllic landscape. In this Arcadia, a rushing river flows in the lower center; under a blue sky and white clouds, rowing figures, boats, swimmers, and bathers create a semblance of a picnic. 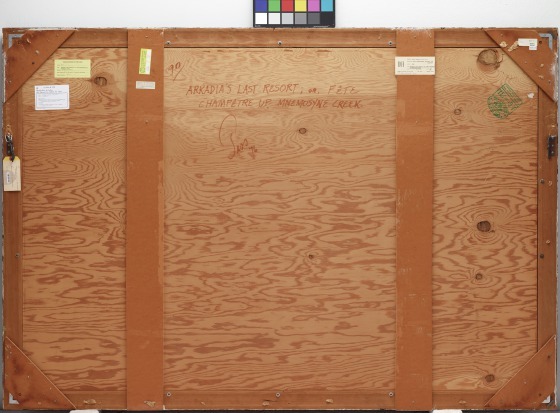 But confounding this sense of "real" space are reproductions of other artworks, including Dallas's Cubi XVII by David Smith [1965.32.McD], flowers, kittens, playing cards, and myriad other things that evoke a multitude of wildly varying stories. Spectacular, garish, and patently sentimental, they are nonetheless irrefutably correct representations of the geographic world, a dense fabric of mass-produced images that surround us and inundate us daily, and yet evade their original meaning, only symbolizing reality. Richard Armstrong, "Jess, MATRIZ/BERKELEY 37," University Art Museum, August - October, 1980. Pamphlet in Collections Records Object File [19771.15]. Visit the artist's official website. See other works by Jess. Compare to a work from Jess's Translation series.